The uvula is that dangly thing that sits at the back of your throat. Technically its full name is the palatine uvula but the full term isn’t normally necessary to use. Much like the tonsils, another easy-to-forget feature of the mouth, a swollen uvula can occur under certain circumstances. A swollen, enlarged uvula can be extremely uncomfortable but is, fortunately, not as common as other forms of inflammation. An inflamed uvula has a small number of potential causes so investigating why your uvula is swollen is not as difficult as other ailments. Still, taking some time to familiarize yourself with its normal functions can help you understand how uvula problems develop in the first place. The entrance to the nasal passage lies behind the uvula, and when you swallow it bends backwards slightly and blocks the opening. This keeps anything you swallow going in the right direction and prevents food from going up your nose. The uvula produces a thin form of saliva whenever you speak or swallow, which coats the lining of the throat. If you have ever tried to speak with a dry mouth, you will understand how useful this can be. The uvula also aids in the production of certain sounds. Along with the tonsils, the uvula helps trap microorganisms and prevents them from getting further into the body. The uvula also helps govern the gag reflex and the reflex’s strength partially depends on how sensitive a person’s uvula happens to be. The uvula is thought to have some involvement with snoring or sleep apnea since it’s been observed to be enlarged in individuals experiencing these conditions. However, it’s unclear if the uvula’s size causes these issues or if the enlargement is the result of stresses caused by snoring or sleep apnea. In addition to a sore throat, a swollen uvula (called “uvulitis”) has several distinctive symptoms that can be easily recognized and reported to your doctor. Trouble swallowing, as the enlarged uvula gets in the way of food. Swollen tonsils. It’s rare for the uvula to be the only part of the mouth that swells, so seeing enlarged tonsils or other areas is not uncommon. Trouble breathing, especially if the tonsils are also affected. Difficulty talking. 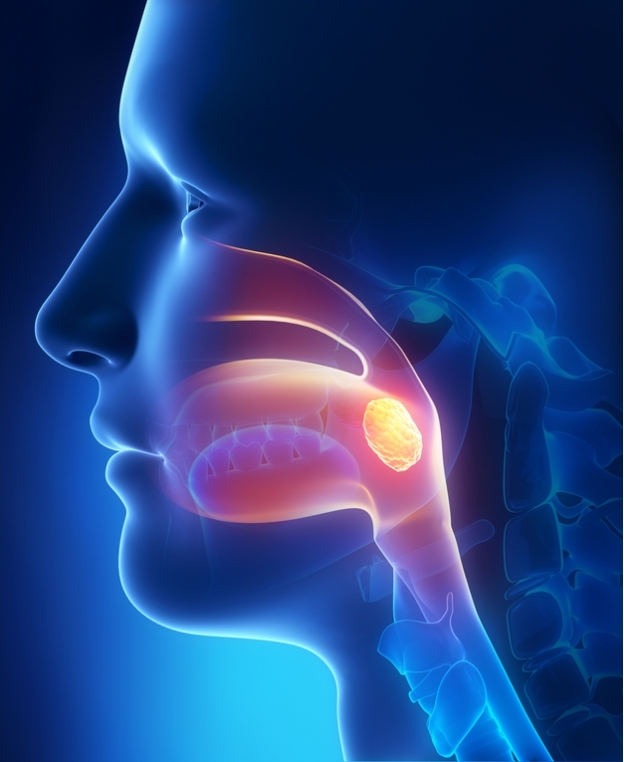 Due to the role the uvula plays in sound production and how swelling can affect other parts of the throat, hoarseness can develop. Gagging, as the uvula potentially brushes against the back of the tongue and triggers the gag reflex. A persistent feeling of something being lodged in your throat. Possibly obstructive sleep apnea if the uvula is able to block the airway when lying down. Nasal regurgitation (where food/drink comes out of your nose). Fever (if caused by infection). There are only a few potential causes of a swollen uvula and fortunately, most are easy to identify or rule out. Much like the tonsils, a uvula infection can develop if the immune system is unable to dispatch a trapped pathogen. As the uvula becomes infected, it will inflame and swell. Both bacterial and viral infections are capable of causing uvulitis, including strep throat, mononucleosis, or respiratory tract infections. It’s worth noting that anything capable of infecting the uvula is also able to infect the tonsils and epiglottis, a muscle at the back of the tongue, causing them to swell as well. A swollen epiglottis is especially dangerous in children since it can block the airway. A child with a swollen uvula should be evaluated by a doctor in order to rule out this risk. Allergic reactions can trigger a rapid fluid buildup in parts of the throat and mouth, leading to swelling. If the reaction is severe enough, the fluid (edema) can spread into the uvula and make it swell. This is usually a sign that an anaphylactic reaction is occurring and requires immediate treatment. Administer an epinephrine shot (EpiPen) or seek emergency medical attention at once. A cleft lip or cleft palate is a type of congenital trait which affects the roof of the mouth. This can result in changes to the uvula such as it being enlarged, off-place, shrunken, or missing altogether. An elongated uvula is also hereditary and although this is not swelling per se, it can cause many of the same symptoms due to its size. There is also a rare genetic condition called hereditary angioedema that causes swelling in various parts of the body and can sometimes affect the uvula. A dry mouth is actually the most common cause of uvulitis and results from persistent irritation. Anything capable of causing a persistent dry mouth, such as dehydration, is also capable of causing uvulitis by extension. As with most parts of the body, injuring the uvula can cause it to swell, though fortunately uvular trauma is not very common. Trauma can occur as a result of injury to the throat or if the uvula is accidentally struck during the placement of a breathing tube (intubation). It’s also possible to get a swollen uvula after drinking or eating something especially hot through an inadvertent burn. A mixture of medical and home remedies can be employed to deal with a swollen uvula. Some solutions are more suited for swelling from certain causes more than others. The main medications that are used in cases of a swollen uvula are antibiotics and steroids. Antibiotics should be used only if a bacterial cause has been identified and should be taken for the full course in order to ensure full eradication. Steroids help reduce swelling and may be employed in treating an allergic reaction. If the pain is difficult to manage, an analgesic may be used as well. Chewing on ice will chill and numb the throat, both reducing swelling (especially if caused by irritation) and ideally easing pain. In event of dry mouth, drinking water is the most obvious way to help keep everything properly lubricated. If the issue is not being caused by dryness, gargling salt water can help soothe inflammation in certain cases. Honey has antibacterial properties. 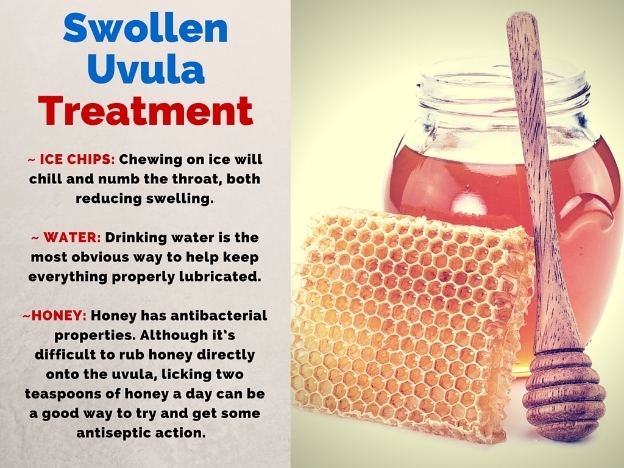 Although it’s difficult to rub honey directly onto the uvula (though kudos if you pull it off), licking two teaspoons of honey a day can be a way to try and get some antiseptic action in case of an infection. The swollen uvula is in a child who is also showing signs of an infection (fever, coughing, etc.). The swelling is creating significant breathing difficulties or interfering with sleep. You have difficulty swallowing and are worried about choking. The pain is not manageable on your own. Pus or blood begins to come from the uvula. This is a sign that the swollen uvula has ruptured and requires immediate medical attention.